Carry Bag for your counter top wire racks Model CB29. Totally portable. 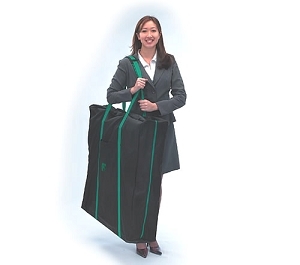 Take our durable nylon carry bag CB29 and arrive at your event in style! Imagine books in one hand and displays in the other, brochures under your arm and Opps... HELP! Not if Fixturecraft's wire counter displays are safely tucked inside our CB29 carry bag. You just carry your displays into your show or exhibit while the CB29 rests comfortably on your shoulder. CB29 carrier will free your hands to transport all your wire display racks. Fixturecraft's display carry bag CB29 is made of durable Cordura® Nylon. Straps have leather pads for extra comfort. Extra strong military zipper won't snag. Perfect for craft shows.